There is no aspect of running a netlabel that is sweeter than when we get to release an album by one of our very favorite artists. Today we have that distinct pleasure, as we present the first release by Robert Carty on Earth Mantra, his exquisite new album Photonic Movements. Robert Carty is justifiably beloved as one of the masters of pure space music, and as one of its most prolific artists as well. For nearly two decades now, he has been producing serene and magnificent electronic music of the highest order. With more than fifty albums available from his web site alone, Robert has such an immense body of work that it is difficult to grasp just how diverse his music is, and how deep his talent runs. But his latest work, Photonic Movements, serves as an outstanding introduction to his art to those who are unfamiliar, just as it will delight those who have known and loved his work over the many years. And what a significant release this is. Folks, we listen to a lot of ambient music, but it is easy to tell when there is a master at work. There are so many superlatives we could use to describe Photonic Movements, but we'll mention just a few. The thing that strikes us first as we listen is the flawless polish that Robert has imbued the album with. The music fits together absolutely perfectly, a completely immersive experience without the merest instant of distraction throughout its entire one-hour duration. It is pure blissful space music, beatless and flowing, like the great sky river itself spanning the entire cosmos from horizon to horizon. Just enchanting. The visuals inspired by the music are intense. The thought of laying back on a blanket, listening to this release, while gazing up at a huge desert night sky simply puts goose bumps on our skin and sends shivers down our spine. This is the kind of music that transforms the listener, the sort of experience that can temporarily transport one's consciousness to a whole new realm, a peaceful and yet energetic journey away from the mundane world into a place of sheer beauty. Stunning is a word that is overused when describing space music, but there is no better way to describe Photonic Movements. This truly is a gem of an album, a masterwork by any measure. 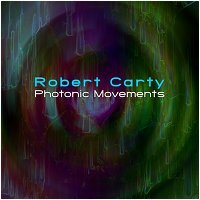 So with great pleasure, we proudly introduce Robert Carty to the Earth Mantra listening audience with his new release Photonic Movements. Certainly an album that we believe will go down as one of the top space music releases of 2011, and in our humble opinion, nothing less than music for the ages. I heard Shimmering on my space music internet radio and when it was over, I dashed over to write down who had created this wonderful piece of craftsmanship in space music. Off I went to find out who Robert Carty is and how I could get this music. Well, I found him and now I have Shimmering to listen to for the rest of my days! That is how long it will take to draw every bit of wonder out of this exceptional piece. Needless to say I will be purchasing a great deal of this fine artist's work. Words are not enough to describe this work! I had never heard of Robert Carty before seeing this release come up on Earth Mantra. The first track 'Shimmering' is one of the most intense and fully-layered pieces of space music I have heard so far, yet it leaves you refreshed and ready for more. The following two tracks are excellent in their own right, but the sheer brilliance of 'Shimmering' left me feeling that they were second-rate. This music is a 'must-listen' and a great work. Thankyou, Robert! Awesome! It bewitches and forces to plunge into dream. Together with this wonderful music I have made surprising space travel.